Corinne Demas is a professor of English at MHC and a Fiction Editor of The Massachusetts Review. She is the award-winning author of numerous books for children and adults, including two short story collections, four novels, a memoir, Eleven Stories High: Growing up in Stuyvesant Town, 1948—1968, and a collection of poetry, The Donkeys Postpone Gratification. Her new Young Adult novel, Everything I Was, will be published in April. Her children’s books include The Littlest Matryoshka, Saying Goodbye to Lulu, and Always in Trouble. We gratefully acknowledge Hyperion Books for letting us include this excerpt from Corinne’s novel The Writing Circle which is available in paperback for the first time. It was the day of testicular cancer. Nancy (a name that no one was given anymore) had laid out the offprints from various medical journals on her desk the night before, but she hadn’t looked at any of them yet. The monthly newsletter she edited had a dozen articles an issue, and she usually spent a day collecting material for each article, and a day reading through it, boiling it down, and writing it up. The newsletter was published under the name of a university medical school, but Nancy was its major author. An editorial board of physicians at the hospital—whose names were used for PR—sometimes suggested subjects for her, but mostly it was she who came up with the topics covered each month. She kept her ear out for what people were worried about, health crises that hit the local news (like the deadly strain of E. coli bacteria that had contaminated baby spinach) and the usual seasonal concerns. She did articles about lower back pain when spring gardening season arrived, articles about skin cancer as summer approached, and articles about frostbite at the start of winter. She farmed out some of the work to freelance writers (she had once been one of them), but she rewrote all the articles herself. The narrative voice she had perfected was professional but jaunty. She sounded like an authority, but her tone was upbeat, even when the article was ultimately informing the reader about some hideous condition that involved suffering, disfigurement, and certain early death. The wise choice about testicular cancer, Nancy knew from an article she’d done a year before, was to wear boxers rather than briefs and to be wary of bicycling. But there was now some new information about tumors and heat, and it was time for a follow-up. The word cancer in the headline was a certain draw for readers. She was making herself a cup of tea when the phone rang. It was Bernard. “I’m just calling to remind you about Sunday,” he said. “Too long ago for anyone to remember,” said Bernard, so softly that Nancy couldn’t tell if the wistfulness in his voice was authentic or ironic. “I’ll see you Sunday, then,” said Nancy. “What makes you think I’m worried?” asked Nancy. “You don’t know me that well,” said Nancy. “It’s in your face,” said Bernard. “Your perpetually knitted brow.” And with that he hung up. Nancy poured the hot water onto the waiting tea bag in her mug and angled the glass cabinet door so she could see her reflection. She was someone who worried, though less so now that her daughter, Aliki, was grown, but she had never thought it was so obvious. Bernard was like that. He said disturbing things, tossed them off, and whether they were true or not, they rankled. Once after he had made a particularly blunt remark about a jacket she wore—“sadly misshapen,” she remembered he called it—she had accused him of being tactless. He was impossible, and she’d told him so. But she liked him, nevertheless, though she knew many people who didn’t. She couldn’t imagine being married to him, though, and she found it remarkable that two women, Virginia, in his past, and Aimee, now, had taken him on. But he was right about her being worried. She hadn’t published anything in years, and she was afraid Bernard—to whom she had foolishly confessed she was working on something new—had pressured the others to invite her to join them. She was not anxious about Virginia, who was unfailingly kind, or Christopher Billingsley, who wrote thrillers and whom Bernard had once described as “hopelessly seeking literary approval.” But Gillian Coit was another story. Gillian was a poet who had been getting a lot of press recently. Nancy had met her twice in the past, and the second time Gillian hadn’t remembered they’d been introduced before. Nancy rescued the tea bag from the now almost too dark tea and carried the mug to her study. It had originally been a glass-enclosed porch, an addition to the back of the antique Greek Revival house, and she had renovated it and installed a heating system. The house was large and there were other rooms that would have been more sensible to use as a study, but she liked the way this room was far from the heart of the house yet still linked to it—an extremity—like a hand from the body itself. When the snow banked up in winter, she could get to her work without putting on her boots. She was away from her domestic life but still connected. She was away from her bedroom, where she and Oates made love, and she was away from Aliki’s bedroom. When Aliki left for college, Nancy didn’t want to alter anything in the room, as if ensuring that Aliki’s departure was only temporary, yet each time Nancy passed the room and looked in, the uncharacteristic tidiness spoke only of absence. Once, for the fun of it, Nancy had written an article on empty nest syndrome, a condition that parents—a higher percentage of females than males—suffer when their children go away to college, particularly acute if the child in question is the person’s only progeny, but of course she could never publish it in the medical newsletter. Although the intensity of the emotion was palpable, not a melancholia brought about simply because of a change in the timbre of the dwelling place, but a response to a cluster of factors: loss of occupation (on-duty parent), loss of youth, awareness of mortality, it was hardly a legitimate medical condition. The name conjured an image of a quizzical robin perched by a nest of twigs. Nancy could write about depression or menopause, but she knew you had no business complaining because your child had made it through high school, gotten into college, and was thriving at that same college rather than hanging around under your roof. Nancy’s study was the room closest to the river, and she had a view of it, this lovely, moving body of water, from her desk. The house itself faced the road with its best front and then straggled out behind, summer kitchen, shed, added on over the decades and then incorporated into the house, one by one. The porch was the last link. From the point of view of historic preservationists, it should have been torn down, since it was tacked on in the 1920s, added by people who liked, as Nancy did, to look at the river but who didn’t like to be bitten by mosquitoes while they did so. Presumably the generation that had built the original house was not so inclined. For them the river’s value was utilitarian rather than aesthetic. If the original owners sat anywhere, it would have been in front of the house, so they could observe what passed on the road. The road was busier now, and cars sped by. Far at the back of the house, Nancy was protected from their noise, protected even from awareness of them. She set her mug on her desk and settled into her chair. She started flipping through the articles awaiting her from The Journal of the American Medical Association and The New England Journal of Medicine, the Mayo Clinic Proceedings, the British Medical Journal. She nudged them to the side and looked out her window—the goldenrod at the edge of the mowed field, the just oranging maples, the brown river, low after the summer. She thought about her father and wondered how he would view what she did for a living. All those years of his secret life when he had studied and practiced medicine, delving into the peculiarities of the human body and the way it went awry, and here she was writing about medical conditions without the slightest training herself, without a single encounter with a real patient. She did not delude herself that she was doing a noble thing. Perhaps people were desperate for information like this, but she was part of an enterprise whose interests were commercial, not altruistic. And for her own part, she did it because it was a way to make a living. It was, by all accounts, an enviable job for a writer. She was paid well, and her hours were flexible. She was her own boss. And presumably she had time for her own writing—for certainly the writing she did for the health newsletter was not her own. Her own, now, was the novel about her father, which she had been working on, bit by bit, for the past year. It wasn’t really about her father, of course, it was fiction after all, but the main character was based on her father. She felt close to him, as if he were still alive, as if by writing about his youth she had given that youth back to him. And it was a way to explore the mystery of the choice her father had made in his life, the secret that had been kept from her most of her childhood. The secret that, when revealed, gave her insight into a man whom she had thought she knew. She had had to wait until he died to write about him. She could not have intruded on the privacy of his past knowing that he would witness this intrusion. She could not bear his knowing what she imagined about him, for imagining takes a liberty with someone’s life, and although her father loved her, would grant her anything, it would have embarrassed them both. Bernard’s phone call had thrown her off course this morning. It had reminded her that she had committed herself to a next step. It was one thing to probe into her father’s story in the intimacy of her manuscript, in the safety of her study. It was another thing to expose it to anyone else. What was she doing laying it bare before someone like Gillian Coit? There was a circle of brown liquid in the bottom of Nancy’s mug now, but it was cold. She spun the mug around once, so the white stars blurred on the blue ceramic background, then she pushed the mug to the back of her desk. She had to get to work now. She turned to the articles in front of her. She began reading through the stack, marking useful paragraphs with a blue felt-tipped pen and processing the information, summarizing it in a few simple sentences. Male testes are located in the scrotum outside the body cavity because it’s cooler there. When testicular cancer cells spread to parts of the body that are warmer environments (like the brain and the liver), they don’t thrive as well and are therefore less resistant to the drugs that combat them. The idea of using heat to help combat cancer is already meeting some success in cases of prostate cancer. Who reading this would imagine its author here now, sitting with her feet tucked up under her, a woman in sweatpants and a T-shirt, a sweater with worn-out elbows slung around her neck? Who would imagine the scene from her window, the monarchs clustered on the purple asters, the river in the distance turning blue-green in the morning sunshine? 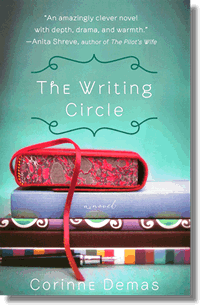 Excerpted from THE WRITING CIRCLE by Corinne Demas. Copyright © 2010 Corrine Demas. Published by Voice. Available wherever books are sold. All Rights Reserved. This entry was posted in Featured Work, Fiction, Novel Excerpt and tagged American Literature, Corinne Demas, Mount Holyoke College, The Writing Circle, women writers, Writers and influences by Sandi Sonnenfeld. Bookmark the permalink. Anyone who has ever joined a writers’ club or workshop or thought about doing so will immediately connect to Nancy’s story. Some amazing lines in this piece, “he doesn’t signify,” “hopelessly seeking literary approval,” and then the bigger truths here about growing older, trying to making sense of the past even as her Nancy’s own daughter embarks on a future without her.